Argus offers FPGA design services and FPGA verification services which is performed by experienced designers with an established track record of complex FPGA designs. 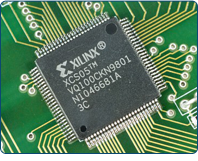 We offer comprehensive design solutions in areas of FPGA and HDL. Our diversely skilled FPGA team brings various services which includes Design/Development, Test suite development, Validation/Verification, and RTL coding. As a complete electronic product design firm we design custom made FPGA boards and also integrate our FPGA designs with existing client hardware. We offer highest quality FPGA solutions services and support for complete FPGA development life cycle with utmost customer satisfaction. Verification Suite development and Automation of the verification enviornment. IP Integration at SoC Level and Verification. Formal Verification: RTL, netlist and at various stages of implementation. Emulation/Target Board for ASIC/IP validation. Systemetic and Qualitative approach for FPGA implementations. Selection of FPGA/CPLD devices for specification, optimum speed/power performance within cost constraints. Design and Implementation of IP blocks. Integration of IP blocks and system level functional simulation. Mapping Designs to target FPGA/CPLD and physical synthesis. Expertise in emulation environment for multi-million gate System On Chip designs. Innovative target board design techniques to enable emulation system seamless interfacing with real time test equipments and debuggers. Exposure to Devices and EDA tools from various vendors (XILINX, ALTERA, Lattice, Actel).